The Moses Mabhida Stadium (Durban Stadium) is a stadium in Durban, South Africa, named after Moses Mabhida, a former General Secretary of the South African Communist Party. It is intended to be a world-class multi-use stadium. 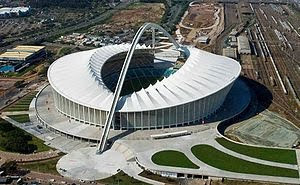 It will be one of the host stadiums for the FIFA World Cup 2010 South Africa. The stadium has a planned capacity of 70,000 during the World Cup and 54,000 afterwards. The stadium is adjacent to the Kings Park Stadium, in the Kings Park Sporting Precinct, and the Durban street circuit used for the A1GP World Cup of Motorsport.